Compatible with any and all ID card printers, these PVC cards are a common choice for ID badges industry-wide. They’re a blank canvas for your ID card needs, able to accommodate a variety of access controls. Compatible with any ID card printer. This product is great to use for IDs. I will purchase them often as we need to make new cards. "Don't order these without a full deck!" Great badges for many uses.We use them for IDs for special guests, visitors, and contract employees. These cards are so much better than our old laminated cards. Much more professional looking. I use this product for membership cards. I can count on the printer to produce as many as 100 cards per day with very little error. On rare occasions, the cards come out a funny color. Easy way to identify children and teachers Room to include both logo and text Durable enough for each quarter of use as well as reuse of teachers' tags. Much better than our old cards. More professional looking and last longer. Cards are holding up nicely. Look professional. No complaints. The 30 mil PVC card works well for our employee name badges. They are easy to work with and durable. Cards look great and the id photos print very well on them. I use the badges for id cards. I love the finish on them and the sturdy material. Definitely worth the purchase! We use PVC card for employee badges and they are great. You can do an employee badge in less than 3 minutes. It is a great purchase the company made to make my job easier. These cards work very well. They are very durable and allow for flawless printing. Just make sure you shuffle the card a little before loading. Static cling makes them stick and sometimes the printer will grab more than one. We provide IDs for Cape Girardeau County workers, and for some State workers. 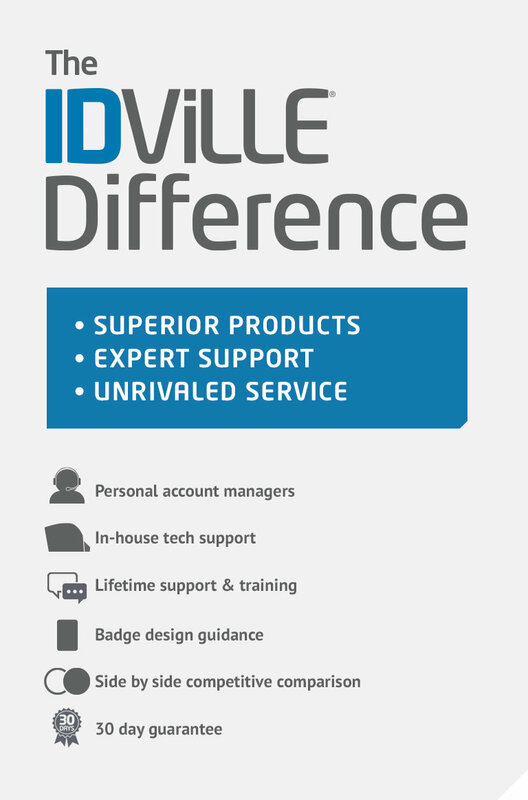 These IDs perform exactly as advertised, and we'll be using IDVille for future orders. Mostly used for visitors and guests for short term/disposable ID badge. The cards from IDVille are great for so many things. In addition to the ID's we make for our students and staff, we offer them for discounts and gift cards as prizes and giveaways to local organizations. You can choose from IDVille designs or completely design your own or mix and match your logo with IDVille preloaded designs. I use this product to create Staff and Student ID Cards for a PK-12th Grade Small School. I include barcodes on the cards that work with: Our library software/hardware, cafeteria meal software/hardware, and Staff Clock-in software/hardware. I am also able to include on the cards photos for identification. Product does what it's supposed too. RECEIVE PRODUCTS VERY TIMELY. VERY COURTEOUS ASSISTANCE WHEN CALLED ABOUT PRODUCT PRIOR TO ORDERING. WORKS GREAT FOR USE WITH EMPLOYEE NAME TAGS IN OUR SCHOOL SYSTEM. I use this for school IDs and every one loves the quality of the card. I have not had any bad remarks or problems with this product. Cards are used for employee badges using the Pebble Evolis Printer. The end result is a crisp, clear and durable ID Badge. Cards are exactly what we needed! Heavy duty badges that print clearly and cleanly. Great product. We had id cards from other vendors in the past that were much thinner. These are great. Rarely have we had anyone come in saying the card is broken. I will continue using this product. Also I will continue using the blue Plastic Card,we are hiring more employees,. Thank you for the fast and very efficient customer service department. This product has been great, and the people at IDville were very helpful with the ordering process! Easy to use with good print quality. Sometimes they break easily where they are hole punched. Also they collect dust and dirt very easily if you accidentally drop on floor. I use this product for making our employee ID badges. This product is well described and works perfect. The price is good for the product. I will definitely buy the product again. The cards work great for our students. Very durable. The cards were exactly what I needed. Staff was very helpful. Excellent service, with good email confirmations and quick delivery. Suitable for everyday name tag, nice size. We use the cards to make ID badges for our State Agency. They work perfect! No smearing or smudges. Photos look great. Cards print up perfectly everytime. We had a quick delivery and excellent product for our badges for students and staff. This is a good functional card for our Employee ID purposes. Cost is reasonable. All employees now have ID badges and they look great! We process new employee cards weekly and i always get the perfect photo, logo, and imprint on these cards. Great for small business employee ID's. The 30 MIL is a good weight. Very durable, as they get exposed to a fast oil change environment, and last a long time. I use this product for making ID badges for our school system. We use the cards for ID's. This product is a great price, good quality ID card. Keep those ID Badges coming! We needed the plastic cards used in the process of making Employee ID Badges, as we discovered that we were out! I called IDville, and they shipped them right out to me,even though this was not a big order in size or amount. We received them and were back in business within a few short days! The expediency with which they filled this order was greatly appreciated! Durable and sturdy. Pictures print well onto card. We use these badges with our Zebra 330i for employee badges. A few hundred per year. They are easy to use and the print quality on them is good. The only downside is that the print will abrade over time unless protected, and with sun/heat exposure, the badges become yellowed or brittle. Great product for a great machine. No problem with the item. They came in a timely manner. Card is good stock and holds up well so far. id cards are so easy to load and that's the only step. the machine does all the work. I just hit "print" and out came a great look id card. Haven't found anything not so great about it. It meets our business needs perfectly. I use the product for activity cards and staff ID's. The service and delivery is excellent! Very easy to use and long lasting cards. I'm an administrative professional for 10 years and I love these cards!! I have been using this product for 3 years it is the best on the market. I am able to design them in so many different ways. Product, customer service, and delivery are excellent. Performance & Quality as described. Performed & quality as described it would. Customer Service staff helpful and quick shipment. Will be a repeat customer. Thanks. We use these to make our school ID. They work out great. I haven't had any problems with them thus far. We utilize the badges for name tags during VBS and other outreach programs. These durable badges last the entire week and can be customized for our events. This product is very reliable...have had limited issues with cards jamming since switching over to new equipment & supplies! Love this product for our employee badges. This machine and products work out really well except for some of our staff cards double print but that is probably something with the computer connection. These cards are great for use as a temp card when we dont need an HID. It was easy to re-order for the ID Maker. The product is durable. IDs turned out great! Many positive comments from staff. These were good quality. We will order again. They print on them comes out perfect. Great product for our company badges! I make student and teacher ID cards for my school. This product works perfectly with the ID printer and software that I also purchased from IDville. This product is used for our school ID cards. After searching multiple on line sites i finally found exactly what I needed at IDville. The IDville team was extremely helpful in my ordering process and the shipping was fast and accurate, so I give them 2 thumbs WAY up!! IDville plastic cards are always very clean and free of any defects. IDville plastic cards are always clean and free of any defects. I use this product for all our student ID cards. It is effective and turns out good quality photos. This is our ID Card We are interested to see how well the printing holds up. Ran out of cards while printing new IDs for the year, placed an order and had it the next day. This product has been very useful and exceptional in our business environment. I use the plastic cards to print Qualification Cards and they are perfect. The color ink prints very well on them and they lost a long time. Works great for the application we use it in. These cards work for staff ID badges. The cards work fine for ID badges the only complaint about the badges is that they break when used by maintenance, custodial personnel and sometimes bus drivers. A little thicker material would probably work better. Good quality cards for the price. We currently use these for our employees who work outside everyday doing landscape maintenance and they are holding up well. The card feeds easily through the machine. We use the cards for employee ids and there is breakage at times, but it could be due to normal wear and tear. I use the IDVille Primacy Printer and cards to make membership cards for my association. It's fast, easy to use, and the color is consistent. The cleaning process is not very intuitive, and I've had some trouble with it. I love these cards! They are now the only ones I order! We use this card for double sided printing, and print about 30-40 cards weekly. -The print comes out clean and clear -The only downside is that if the card is not clean, it is hard to get the dust and particles off, and when you print on it, the ink does not come out clean. We use this product on a daily basis for identification badges for our employees. We had previously used a less durable card that when moistened would be unreadable. This is a very durable product and we've been told withstood the washing machines of many of our employees. Great product - what I expected. The cards are extremely durable. Delivery was on time and quick! These cards make great name badges! This company gives great service. Good product and ship time. The white plastic cards are great for Badge ID's. The cards are great! We print on both sides and are pleased.